Mundra International Container Terminal (known to all as MICT) is India’s first Greenfield project in a minor port to successfully commence container terminal operations. MICT commenced operations in 2003; it was a clear trigger to the changing face of container trade in India. Up until 2003, container trade was restricted predominantly to terminals in the major ports across the coastline, and no one really thought that a minor port in such close proximity to India’s largest gateway (JNPT) would succeed. 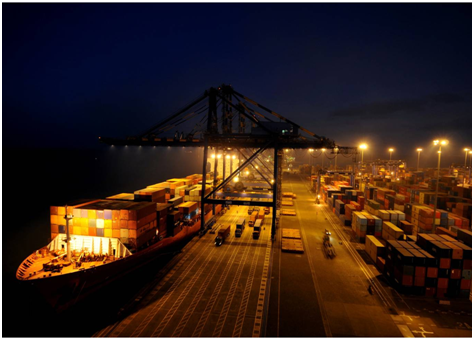 MICT became India’s first container terminal in a minor port to commence operations. As one of the most sophisticated and technically advanced port facilities in the Indian Subcontinent, strategically located at Mundra port in the State of Gujarat, MICT is the closest gateway to the largest cargo generating regions of North and Northwest India. Open all year round with no tidal restrictions, MICT has an ability to handle some of the deepest container vessels afloat today. The success of MICT can be clearly attributed to the visionary mindset of the P&O Ports management that saw the benefit in investing in developing a container terminal that would provide the growing Indian trade with a formidable competitor to JNPT, and would alleviate the trade from the challenges it was facing at that point in time – underdeveloped road infrastructure, congestion at port, limited draft, delays in dredging etc. It is managed under a 30 year Build-Operate-Transfer agreement set up with the Adani Group. From handling 20,000 TEUs in its first year of operations, MICT handled over 1 Million TEUs in the year 2014, the 1st terminal in Gujarat to achieve the feat, also placing it among the top five container terminals in the Country. In 2014 MICT handled 624 vessels and 1930 trains.